Winner is #250- DMackee~ Congratulations! I went out yesterday afternoon with the daughters for a "girls-only" lunch. We tried out the new Triple Dipper appetizer from Chili's. You get to pick 3 appetizers that come with dips all on one plate. We ordered two Triple Dippers~ Boneless Buffalo wings (2), Chicken Crispers, Big Mouth Bites (tiny cheeseburgers), Spinach & Artichoke dip, and Fried Cheese. I told the girls we would start off with the appetizers and then we can always order something else if we were still hungry~Yeah right! We were pushing ourselves to finish it all! My personal favorites were the Boneless Buffalo wings, the Spinach & Artichoke dip (with the best tortilla chips I have ever eaten) and the Big Mouth Bites burgers were awesome! They had so much flavor packed into those itty bitty burgers! Chili's is running an awesome sweepstakes on their Shout Out To Eat Out site. They will be giving away a $20 Chili's gift card daily and have a grand prize of a $333 gift card! All you have to do is fill out some simple information and then upload a photo of yourself into your choice of a "trio". How do you like me as one of the Three Musketeers? I thought it was hilarious! *Mandatory entry: Go here and type Momfiles in the blank field. Easy huh? ~ Let us know what 3 appetizers you choose for your own Triple Dipper? 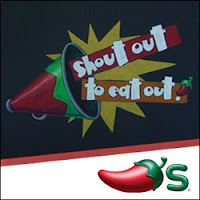 Win a $20 @Chilis GC @momfiles http://tinyurl.com/3gcyjm5 and enter @Shoutout2eatout for daily drawings! This giveaway is open to US Residents only and will end at 9:00 PM on June 12, 2011. Please leave your email address if you do not have a Blogger Profile. One winner will be chosen at random and will be contacted by email to claim prize. Good luck! Now onto the Chili’s Good Things Come In 3′s Linky Rave Giveaway Event! Hop around to as many of the blogs below as you wish, read their Triple Dipper review and their Good Things Come in 3′s giveaway rules, and enter to win a $20 Chili’s Gift Card on each blog! Disclosure: I received a gift card to help facilitate my review. All opinions are 110% mine as always!